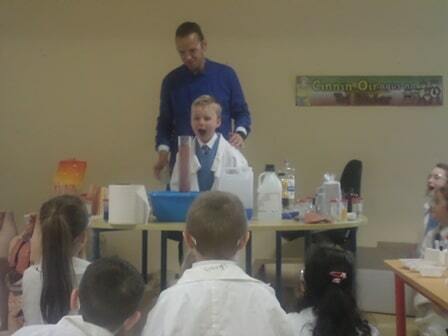 First we tested bread, cornflakes and mushrooms with iodine. We used a pipette. We wanted to find out which food went black. If the food went black it meant that it had lots of energy in it for us and was good to eat. The cornflakes and the bread went black. The mushroom didn’t. David told us that this did not mean the mushroom was bad for us, but that it might not necessarily give us much energy to do fun things like playing. Better off sticking to bread and cornflakes. Mushrooms do have lots of vitamins and minerals. We then tested orange juice, water and yogurt for vitamin C. The orange juice was the only liquid that had vitamin C. Although it only had a very small amount. David said he would contact the people who make the juice to ask them why there was so little vitamin C in the orange juice. Let’s hope he gets an answer! Lastly David and a very special helper, made the famous elephant toothpaste for us! It was fantastic. The photo is below.